Discussion in 'iOS 5 and earlier' started by Jare, Jan 25, 2012. 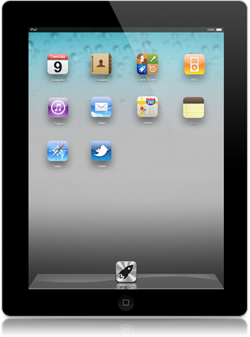 Please use: http://forums.macrumors.com/showthread.php?t=1321499 to discuss my new iOS 6 concept. ** CYDIA TWEAK COMING SOON ** If you'd like to be a part of the dev team, please PM. So I have been thinking of how we could improve on the iOS homescreen. A grid of icons get's very boring, so I'd like to introduce you to my concept of iOS 6. (And soon to be a Cydia tweak, hopefully!) It has some radical new changes you will love. This is not the final version, but a demo idea. As I tweak and perfect the idea so I can turn it into a real cydia tweak I'll create much larger scale images with more clarity/graphical improvement. So this here would be a "typical" homescreen. A widget, icons able to be arranged in any order/placement you'd like. Notice the 2nd icon on the dock? Ah, the grid of icons. It's not truely gone, but it's now away from our homescreens and only one tap away. The background is blurred (probably darkened or something as well) and getting back to our homescreen is only a tap of the home button (or launchpad icon) away. This screen can be customizable, have folders, etc. Just like your home screen. Can hold 4 rows of icons, and swipe-able to the next page(s)! It contains all of your apps. Of course I also want to take my hammer at redoing the notification center sans linen and widgets. So this here would be a "typical" homescreen. A widget, icons able to be arranged in any order/placement you'd like. Notice the 3rd icon on the dock? Ah, the grid of icons. It's not truely gone, but it's now away from our homescreens and only one tap away. The dock gets hidden, the background is blurred (probably darkened or something as well) and getting back to our homescreen is only a tap of the home button (or launchpad icon) away. This screen can be customizable, have folders, etc. Just like your home screen. Can hold 5 rows of icons, and swipe-able to the next page(s)! It contains all of your apps. What do you all think? This *could* work on an iPhone, to a lesser extent. Isn't this what Android is doing right now? Sort of. Launchpad is a OS X feature though, and we want to merge iOS with OS X further.. why not bring Launchpad? Just get yourself an Android phone already. This is embarrassing to even look at. Get yourself a Mac already. This is embarrassing to even read. So let me get this straight... You want an iOS feature that emulates an OSX feature that emulates an iOS feature. OS X emulates the homescreen of iOS, we're emulating the desktop of OS X. Why can't you people just enjoy something? This looks exactly like most Android Launchers. Renaming the Launcher to Launchpad doesn't magically turn it into iOS/OS X. Also, an extra tap just to get to your apps would be a bit un-Applelike. They spent ages reducing the number of taps needed for common tasks, just like they did with the iPod menu system before it. Slightly off-topic, but why do people making mock-ups always use ancient screenshots? Why would iOS 6 return to the old Voice Memos and iPod icons? 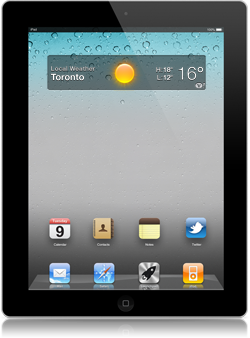 I'm sure that iOS 6 will have live widgets in some form. Apple have already begun the process by putting stocks and weather on the Notification pull down. Apple need to make these notifications apart of the SDK. I guess my problem with this is that it places too much importance on widgets. When I'm unlocking my phone 99% of the time I want an app and 1% of the time I want to see the weather. Seems backwards that I should see widgets first every time. With widgets I think Apple will continue on the path they have with notifications: Using both the lock-screen as well as some off-screen gesture-accessable widget area. So...always close by and also a part of the un-lock process, but never as an impediment to getting to the apps. Although I do want widgets, I view apps as more important than widgets, and from what I can tell, Apple feels the same. I'm not a fan of this concept. Looks too Android-ish. Others want weather more. It's one of my primary purposes, to check temps before run or ride in the way GA oscillates between extremes. Lockscreen could be nice though. the only thing i like about this concept is that you don't have to see all your apps or hide them in folder necessarily. the thing that has been bothering me about iOS lately is managing applications. there are so many that are useful, but only need every now and then, but putting them in a folder kinda makes them disappear. its a conundrum. Then I would argue that you'd be better served by having that in the lock screen, as you said. I'm having trouble of thinking of things that are more important than apps, but less important than the lock screen. That's such a narrow range for things to fall in. All this really does is makes me have to press an extra button to see all my apps and wastes valuable real estate on the home screen. Remember in Isaacson's biography how many times he mentioned that steve would design something so that you could get where you needed to be in 3 clicks? The thing is, weather should not be the only option because plenty of people would prefer something else. Personally, I have never used the default weather app/widget. I prefer a dedicated, local app because the Yahoo weather readings seem like spray&pray sometimes. Also, local apps give me more accurate readings for every hour and rain radar etc. Usually I just use a good ol' thermometer though, forecasts are always forecasts. I think there should be an option for something else, e.g. latest tweets or FB status updates. You want iOS to move towards looking like most versions of Android? It's a great concept, he did a very good job on it, but you all need to remember while you're complaining that it's just that, an idea. I wouldn't use widgets myself, but I can see why others would find them useful. I like the concept though I think the launchpad for iphone would be an unnecessary step to get to your apps and I think for an iphone being a portable device, simplicity is key and creating an extra botton to view apps would simply be an annoyance for users in the long run. I used what was available as an icon psd. I wanted to use as close to Apple icons as possible. There isn't really any psd's around that have the updated icons. Had to make the launchpad one from scratch. In all seriousness though, I think it's an awesome little idea, but it needs refining, launchpad should be it's own thing, not taking an icon away from the dock, I like having Phone, SMS, Safari and Mail as my bottom 4, and having to remove one seems needless, a swipe may be more appropriate, also, having those 4 icons above the dock permanently seems to negate the dock graphic in the first place. This is a really great idea, but like most mockups, there's a few kinks that should be worked out. In all seriousness though, I think it's an awesome little idea, but it needs refining, aunchpad should be it's own thing, not taking an icon away from the dock, I like having Phone, SMS, Safari and Mail as my bottom 4, and having to remove one seems needless, a swipe may be more appropriate. I thought of that, it was one of the first designs I mocked up. The issue with that is there wasn't a good way to implement it without removing homescreens for people to use. For example, I think it would look ugly if all your apps were still stuck on the Springboard and the only way to "hide" them would be a folder. This way your apps aren't anywhere but launchpad, and shortcuts can be used to these apps via Springboard. They wouldn't be permanent. The only thing that would be permanent would be the Launchpad icon in the dock. (It can be moved into any of the 4 spots, but not off the dock itself.) That was just my graphical lazyness that you see.